Shawn Porter earned a stoppage win over late-notice opponent Erick Bone, while Chris Arreola prevailed in a heavyweight slug fest against Curtis Harper. This second imprint of the Premier Boxing Champions series, on Spike TV, managed to dodge a catastrophic farce. Shawn Porter's originally scheduled opponent, Roberto Garcia, failed to show up to the weigh-in having failed a physical exam due to dehydration and vitamin B12 poisoning. Within twenty-four hours of the contest, two fighters, Karim Mayfield and Erick Bone were contacted as last-minute replacements. It is rumored that both fighters had signed contracts to fight Shawn Porter, both had shown up for a pre-fight weigh-in the morning of the fight, and both made the contracted 149-pound weight limit. Ultimately, the decision was made to go with Erick Bone who, in retrospect, was probably the opponent preferred by Team Porter, though it is unclear who made the final decision. 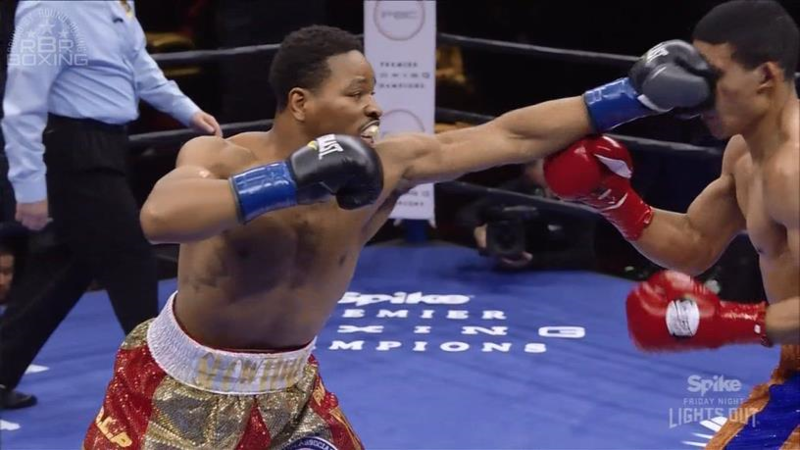 Shawn Porter was coming off his first defeat to Kel Brook in August of 2014. Prior to the defeat, Porter and Keith Thurman were regarded as the most feared welterweights. Porter scored a sensational win over Paul Malignaggi in a fourth round TKO in which Malignaggi went down twice, reportedly leaving on a stretcher to be taken to the hospital where it was found that he had acquired a hematoma behind his left ear. But Malignaggi is infamous for his lack of punching power; he also lacked the physical strength to hold Porter on this inside. Stylistically, Porter was made to steamroll over Malignaggi. Kel Brook was able to control Porter with his jab and straight right hand on the outside, while tying up Porter in close. By the final rounds, Porter had fully abandoned his technique, even changing his guard to something reminiscent of a Mortal Kombat video game. The 149 pounds contracted weight was clever. For what natural welterweight (147lbs weight limit) would have made that weight the morning of a fight? Neither Mayfield nor Bone were official welterweights – Mayfield had recently been trying to get a fight with Adrien Broner at 140 pounds. Thus the weight limit created a situation for Porter wherein he was guaranteed to have a weight advantage, well suited to his inside mauling style which worked to perfection against Malignaggi. Anyway, round one began with Bone being very tentative, fully aware of Porter's speed and power. Porter used his jab but showed little to no head movement as he attempted to work his way inside. Bone did not use his jab at all, only trying counter Porter with a right hook as Porter came in. Rounds two through four saw Bone being more active offensively, though he relied too much on wide hooks which the diminutive was able to slip by dipping low and staying close within the range of Bone. Porter, although more accurate and controlling the style of the fight, missed frequently as well. Bone attempted to make an adjustment by round five throwing uppercuts and bolo punches, hoping to catch Porter as he bent low. Bone went down three times in the fifth round. The first appeared to be a slip, but may have caused an injury to Bone's right knee or ankle. After getting to his feet, Bone's balance and movement was noticeably impaired. Bone took a knee after being swarmed by an aggressive Porter. The last knockdown came in the same round as Bone was hurt from a right hook to the jaw while helpless against the ropes and went down from a further accumulation of punches. Bone was unable to make the count. Porter improved to 25-1-1, 15 KO. After the fight, Bone took off his right shoe and was observed limping to his corner. Porter's early stoppage of Bone graced us with the opportunity to view Arreola-Harper, originally slated to be untelevised. Acceptability is in the eye of the beholder. While it is this author's opinion that this fight was utterly disgraceful to the image of boxing, fans and other writers on social media expressed their gratitude. To begin with, Chris Arreola weighed in at a completely out-of-shape 262 pounds for this fight, his second heaviest weight ever; Curtis Harper was even several pounds heavier. Harper's ring entrance was curious. For, rather than bending over and shifting himself between the ropes as most fighters do, Harper entered by swinging each leg over all three ropes in a way that made him appear unsteady and immobile. It did not look good. In the first round, both fighters started as fast as the inertia for their body masses would allow them, swing recklessly with hooks, completely squared to each other. To hell with technique. Harper was hit cleanly with an overhand right to the chin; he dropped both hands, head bent over as if sleep, and skidded backwards from one side of the ring to the other side, falling on his back and almost out of the ring. Harper was able to survive the round, for even in round one Arreola lacked the aerobic fitness to increase his punch output to finish off Harper. Harper seemed to get the better of Arreola in rounds two and three and hurt Arreola on several occasions from single blows (right hooks and uppercuts) at a time. This time, however, it was Harper who lacked the aerobic conditioning to stop Arreola on a barrage of punches. Harper adjusted to Arreola by getting low to avoid Arreola's overhand right. Arreola did not feature an effective left hand during the fight, and even began slapping with the overhand right as he fatigued. In rounds seven and eight, Arreola's cardiorespiratory fitness fails him again, unable to finish Harper after hurting him. Arreola won a unanimous decision (76-75, 78-73, 77-74), improving his record to 36-4, 31 KO in the scheduled eight rounder. There was no demonstration of skill or technique in this affair. This looked like a reality show. 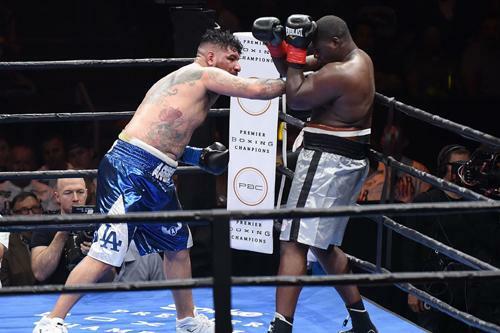 Porter, Arreola victorious in California.